PVA continued to grow our Hablamos Juntos project with Museo Eduardo Carrillo, and Young Writers Program, creating curriculum designed to empower our Latino community through personal dialogue with noted Latinex artists. Developing consistent educational materials for exhibits deepens the engagement for both children and adults. The powerful art work is used as a basis for a curriculum, combined with in depth materials presented by each artist. The project is designed to spark children’s interest in and about art, pursuing a career as an artist, or considering how to bring art more consistently into their daily lives. The Young Writers Program, works with students to respond verbally and in writing to the art work. This has resulted in the publication of a series of books that combines the images with written reaction from students. In 2016, the images from this project were placed throughout the Watsonville Community as the focal points for an Art Walk through the streets. Several of the artists were present to discuss their work and answer questions from the general public. 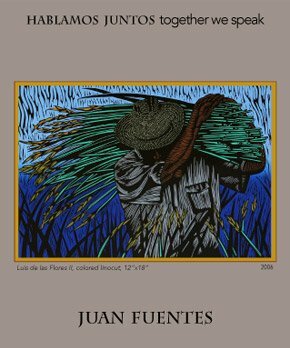 In 2018, PVA, Museo Eduardo Carrillo and the Young Writers Program presented an exhibit at the PVA gallery, Hablamos Juntos/Together We Speak: Un Diálogo Visual/a Visual Dialog, based on our poster series. Curated by Juan R. Fuentes and Michelle P. Mouton, the Hablamos Juntos exhibit explored visual dialogs created by prominent California Latinx artists. The exhibit ran from August 8-October 7, 2018 was extraordinarily rich. Experience how our artists give voice to and navigate: daily life, current events, social, political and cultural issues, community, ethnicity, as well as personal narratives, myths, and history. Click here for a virtual tour. Visit our Facebook page for additional photos.